The Internet is more crowded that ever before with no end in sight. Standing out is more difficult; getting found is an art in itself. Websites are no longer what businesses and nonprofits need in order to to be digitally available to clients, donors, and consumers. Social media, news feeds and blog articles, and quick bites of video all extend a site’s reach, lifting it ever higher on the wings of Google, Yahoo, and Bing. So what trends in 2016 are worthwhile? Flat design. Websites need to look good on all sorts of devices that are all sorts of sizes with all sorts of lighting conditions: indoors, outdoor, low light, bright light. The art of website design has fallen flat. Not uninteresting—yet the illusion of 3-dimensions like drop shadows, gradients, and textures have fallen out of grace. Flat design is the art of clean open spaces with crisp edges, bright colors and 2-dimensional flat icon-like imagery. Flat design gets down to the job of communication without distraction. Natural-looking photos. People will always make decisions or purchases based on emotion, and images will remain the catalyst that moves us. But the cheesy stock photos of smiling people with perfect teeth is over. The trend is towards more natural-looking photos that genuinely resonate with audiences. Other trending imagery are icons and video. Icons are illustrations that help us visually navigate site content and that create connections between shapes and words. Video communicates ideas and emotions and build real-life experiences. Better typography. Thanks to Google and other outlets for free typography for websites, typeface choices have expanded. With so many choices, there’s a tendency to decorate sites with outrageous choices that detract from the message. Good design uses typography that sticks to sound principles of compatibility, load time, and design purpose. No project should have more than 3 typefaces, each of which match the tone and messaging of the brand. Responsive design. With almost 70% of searches being made from a mobile device, responsive design is critical. In the past, designers built one site for desktops, and another stripped-down version for mobile. Now one responsive site delivers a great user experience across all devices and screen sizes. When content is updated or an SEO strategy is implemented, everything happens on one site. The time and cost factors benefit both site owners and their developers. At the end of the day, trends come and go. 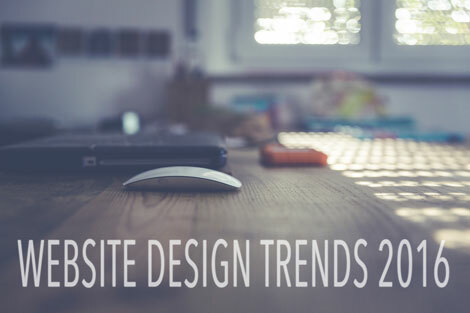 We think these trends will stick around at least through 2017. What never changes is the personal branding experience: how you or your company is perceived by others. As Jeff Bezos, founder of Amazon says, “Your brand is what people say about you when you’re not in the room.” Always pay attention to your brand.